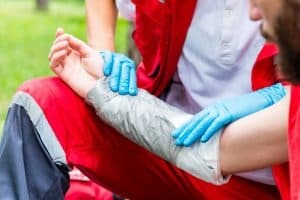 Burn Injuries in the Workplace | Larson Law Firm P.C. According to the World Health Organization, about 180,000 people die each year from burns. Burns happen mostly in the home or workplace, and often should be preventable, though there are exceptions to every rule. Yet many workers suffer serious harm from burns on the job every day, and the damage done in an instant can last a lifetime. Explosions. An onsite explosion can cause more than thermal burns (the type you get from touching a hot surface, or coming in contact with flames directly); they can also lead to friction burns, as debris scrapes across your body. Radiation exposure. Working with radioactive material is, of course, one way to sustain a radiation burn. So is working near or with radio waves, which the FCC monitors for output; near high-powered microwaves, and while using equipment such as X-rays. Chemical exposure. Chemical burns happen when the skin is exposed to an irritant that contains an acid, like ammonia, battery acid, pool cleaners like chlorine, various laboratory chemicals, or bleach. Compounding facilities, janitorial services and mechanics’ shops all pose a risk to workers. Electrical arcs and shorts. When an electrical current runs through the body, it can result in burns. The amount of damage depends on how long the body is exposed to the current and the strength of the current. Electricity flowing through the body can damage internal organs as well. Sometimes a victim’s clothes can even catch fire. Scalding. Many jobs require handling hot substances, like boiling water, food, metal, or tar. Steam can also cause burns. Exposure to these without protection can result in scalding. Here in North Dakota, fire and explosions are risks to be especially wary of on a job site like an oil field. The highly flammable nature of oil and gas is potentially extremely dangerous if proper precautions aren’t taken by an employer. OSHA regulations require that employers adhere to certain safety standards on their sites, and that employees are trained to properly handle hazardous materials and have proper safety equipment. If an employee suffers injuries and an employer didn’t follow standard OSHA guidelines, that employer may face a citation and fines, and the employee may have a claim against them. An experienced burn injury lawyer can answer your questions and talk you through your options. Burns can cause devastating injuries that can leave scars and pain lasting a lifetime. You shouldn’t have to suffer due to someone else’s negligence, as well as lose your ability to work and quality of life. The burn injury lawyers at Larson Law Firm, P.C. will hold the responsible parties accountable. To schedule your free initial consultation with a North Dakota burn injury lawyer, call our Minot office at 701-484-HURT, or fill out our contact form.